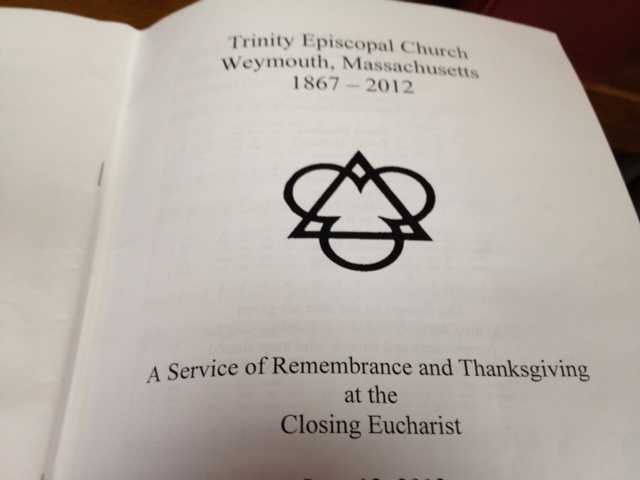 I spent the afternoon of Father’s Day at a service that marked the closing of a local parish, Trinity Church, Weymouth (this may or may not have been more painful than the kids making me breakfast in bed — though I wouldn’t know since I always leave for the early service before they’re awake). I’d never been to such a liturgy but they’re becoming more common as parishes close all over the country. I won’t comment on the liturgy itself — it was presided over by Bishop Bud Cederholm who did an admirable job striking a tone of hope in the midst of difficult circumstances. But what struck me more than anything was the emotion displayed by some of the long-time parishioners. There were tears and there was tangible grief. In this sense it felt like a wake, albeit with the whole church building serving as a wide-open casket. It’s hard to know why a particular parish suddenly becomes unsustainable. A lack of money and dwindling attendance are the “presenting issues” (to use a therapeutic term), but what is it that brings a parish that has held on for so long to its ultimate demise? I’m not thinking specifically of Trinity (I’m not familiar enough with the situation) when I say it’s usually a lack of creative, energetic, entrepreneurial-based, and Spirit-inspired leadership. While we talk about the “community of the baptized” and the “priesthood of all believers,” I still don’t think a parish can thrive without strong clergy leadership. Yes, it takes an entire congregation working together with a common mission for sustainable, long-term growth and vitality but a lack of clergy leadership can do irreparable damage to a congregation. Some priests are natural leaders but I think leadership skills can also be learned and if we’re not focusing on leadership skills in the training of clergy we’re failing the people of God. It’s not enough of a mission to proclaim “Services at 8 & 10 am” and “All are welcome.” Yet that’s precisely what so many of our parishes do. In this spiritual environment, opening the doors a couple times a week isn’t a compelling reason for people to enter — and they won’t. A passive approach to church growth that expects people to come in and stay because “we’re friendly” is no longer viable. It’s one thing to open the front doors and wait for people to show up. It’s quite another to fling the doors open wide in welcome and actively invite people into vibrant community. Congregations that don’t actively seek to share the Good News of the Gospel with others will eventually whither away. Even the True Vine needs some occasional pruning. Thus, while no one wants to see a church close, I also don’t have a problem with it. Not because it isn’t painful and emotionally gut-wrenching for those involved but because I believe in Resurrection. Sometimes death must occur in order for Resurrection to take root — and that’s the truth at the heart of the Christian faith. Okay, I’ll say one thing about the liturgy; I can’t help myself. I won’t go into details since I don’t really get it but a thing (spool?) of yarn was involved. It started at the front of the congregation and then wound around to every person before returning to the front. 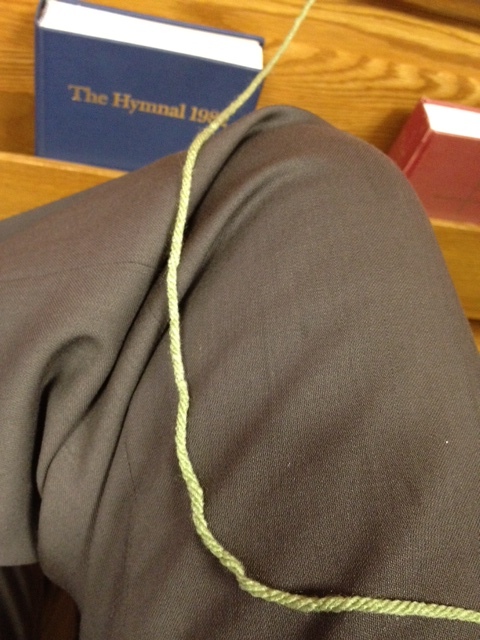 Then we sang “The Tie that Binds.” Interconnectedness? Knitting a scarf? I’m not sure. I do wish the best for the few remaining parishioners at Trinity, Weymouth. I pray they will eventually feel the power of the Resurrection through this experience of congregational death. And that they will soon find a parish out of which they can continue to live out their baptismal vows. If I were an architecture professor, I’d make sure to offer courses on how to re-design and re-work old church buildings. There are many on the market and, as you note, more to come. The other thing I’d say is that it would be handy to have some liturgies for this. In my experience, congregations and clergy have to develop their own. This might be a project for a revised version of the Book of Occasional Services. I will say that the ELCA equivalent to the B.O.S. (the name of which is eluding me at the moment) is a much better resource than our B.O.S. and has a few options for services of this nature. Tim – I appreciate your blog post. However, I think it is a little short-sighted to point only to clergy leadership as the crux of the challenge. Of course, we need good clergy but once a certain low level of membership has been reached, such parishes become very difficult to grow regardless of how dynamic, smart, trained, and faithful a priest might be. I would say both strong clergy and lay leadership are needed – as well as an openness to bring the Gospel to the world, rather than serve only parishioners’ own needs, and being generous, even sacrificial, in our stewardship practices. My point is that clergy are not the only ones who can exercise leadership in the life of the parish. Thanks! You’re absolutely right, Jesse. The liturgy today was a “regular” one — aside from the bishop’s preaching and a couple of pre-designated parishioners who stood up to speak eloquently about what the parish meant to them, there was no liturgical acknowledgment of the grief involved (well, besides the Eucharist). For a liturgical tradition such as ours not to have a liturgy for a church closing is a pastoral admission. No one that I know of has put together a compelling liturgy for this which may be denial on our collective parts. I mean if Enriching Our Worship 2 can have a liturgy for taking someone off life support, we should have something commissioned for cases such as this (and I’d actually see some similarities in many cases). Amma Kim, I actually agree with you. My only point is that we’re so quick to speak about equity in ministry and church leadership that we forget just how pivotal the role of a priest is in a congregation. A priest’s role isn’t more “important” than anyone else’s but if the priest him/herself is not an effective leader, that’s an obstacle that is tough to overcome. So sad. I preached there when at Episcopal Divinity School during my field-ed placement at a member parish of WMBQ. It was also the first parish in which I chanted the Exultet. Perhaps this ‘closing’ is a new beginning for a new way of doing church in the future. the church is either a useful tool to humanity or it is useless. god exists in all places. gathering in one place to celebrate god needs to be useful to all. i help up my brother and my brother helps up another. too often it is the extremes, the very rich and the very poor, that get served in church and the working class and poor are those that serve. 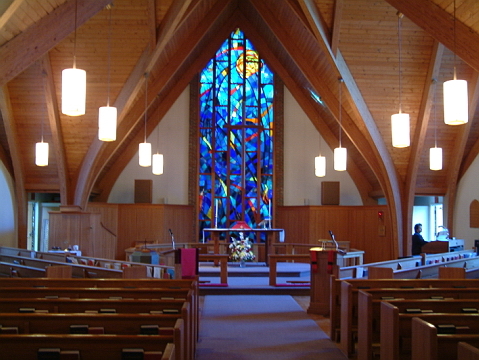 There were many factors that led to this closing and everyone bears some responsibility; from parishioners who would not pledge or take care of the building, to a lack of direction for ministry. The fact that for so long parishioners did whatever they wanted, whenever they wanted, and never realized what being an Episcopalian meant hurt this congregation. (Because they had not been taught.) In the end, they found out just what kind of authority the Bishop and Diocesan staff exert over the Church. Ftr. Tim is right, clergy leadership is essential to a church that is going to proclaim the Gospel and do the work that God has given us to do. It does not relieve the laity of their responsibility. BUT someone has to be in charge and lead. By the way, the parish had a beautifully written liturgy for the previous Sunday Eucharist that acknowledged our history, closing, grief, and sense of loss. You might say we did things backwards; the private funeral and then the public wake. The closing Eucharist was exactly what the Planning Committee wanted. Thanks for your leadership throughout this process, Cathy. No one answers the call to serve as Senior Warden hoping for such an outcome. But you have handled this with grace, compassion, and love. I wish that you had gotten more support along the way and that speaking the truth about the situation hadn’t evoked such anger. Prophets have a tough lot in life — especially when they have to deliver news that no one wants to hear. Heal well, and know that there is always a place for you among us when you’re ready. When I closed a parish in Roslindale in the 1980’s, we had a diocesan liturgy at convention so the whole diocese could grieve. There were fewer liturgical resources then, so we adapted the service for consecrating a new church building by putting it in reverse. I can’t agree with you more about your observation regarding the need for strong clergy leadership and am trying to do my bit for the cause over at Discernment Doctor – http://stephentayres.com/. Steve, fewer liturgical resources but fewer church closings as well. If we spent diocesan convention engaged in liturgies for closed parishes we’d never get out of there! Thanks for your continued work with the discernment process — I encourage everyone to check out Steve’s blog! You can guess what I’m going to say, right? It also has to do with communications — strategies, tactics, and content. Reaching people where they are, adjusting to how they receive info and learn, etc. etc. and, like you, I stay anchored in believing in the Resurrection, relative to church closings and other real or symbolic deaths. I bet you could name a few things we do at Convention that could be dropped to make room for acknowledging the loss of sister congregations. I bet we could both name things that could be dropped for no other reason than dropping them. Rev. Gail, I don’t follow you. How has this become an object of ridicule? And, yes, I would absolutely criticize a funeral liturgy for a brother or sister if it wasn’t done with dignity, faithfulness, and the preaching of the Gospel. Tim – this is a faithful and thoughtful post, and I like the tone you strike. My family left a small Episcopal Church a few years ago for another Episcopal Church further away. Why? The small church was happy to have our time, our talent and our tithe, but no one had any interest in us as people. I can count on the fingers of one hand the number of times anyone invited us into their home, out for coffee, etc. and that, sadly, includes the rector. When we left, everyone wanted us back – but though we did not move, no one called us for coffee. Maybe we’re just not nice people. All I know is that in our “new” church, people made a point not only of welcoming us, but of including us in and outside of the sanctuary, and not just on Sunday morning. The little church is struggling on as their members age, and cannot understand why it is difficult to attract new members. I will be sad when if they close, but not surprised. A community is only as good as its members and the attitude of, “they’ll find us” just doesn’t work any more. Thank you so much for your post, Father Tim. We are a parish in the south who are struggling with just those issues. I like to say that for the majority of our small parish, (empty nesters) their needs are met and they are satisfied. A homily on Sunday prior to tee time. For those of us with young families and a strong desire to be fed more, we are starving. No children’s programs unless we initiate them for our own children and sporadic adult formation. I don’t think our parish wants a mission–that could be scary and who knows what we might be asked to do? I must confess I only skimmed the article and responses, so this question may be out of order, but was a deconsecration of the building an actual part of the liturgy? If not, there are some unresolved issues for the church. Yes, closing Eucharists do help members of the congregation let go, heal, and move on, but there are some other reasons, which seem to be overlooked all too often, for a closing Eucharist. Just curious. One big challenge faced by so many parishes is how to make “small” work – everything these days is about “big” – big warehouse stores, Big Gulps, big churches. For some, especially many introverts, small is just right – calling to mind those early days in church history when small groups met in hidden places. I’d like to see the Church try to address this. Ann — and therein lies the problem. Without a sense of mission people starve. In this increasingly post-denominational world, few are going to stick around simply because they like the Episcopal “brand.” Again, it’s a leadership issue — if the parish leadership both lay and ordained — don’t have a sense of urgency around mission, the parish will die a slow (depending on endowment funds) death. Father Rich, what do you mean you “only skimmed” this! Just kidding. The building was not deconsecrated. I’m actually not sure what the requirements are here. The parish hall is still being rented to a Brazilian congregation. Do we deconsecrate churches once the last Episcopalian has left the building? Do we refrain from this as long as other Christians are worshipping there? I don’t have any experience with this. Anyone have any answers on this? Cate, I agree with you about sacred space. While Jesus is everywhere, there is still something about a place where generations of prayers have been lifted up. I wonder if the future may be small “congregations” within larger ones. I have to think this through. I was involved in the deconsecration of a church just north of you a few years ago, St. Matthew and the Redeemer, South Boston. The congregation wanted to hold their last service in private and their wish was honored. A few months later, Bishop Harris, accompanied by the regional dean (moi), the former priest (who was transferred to a larger, healthier parish in recognition of his thankless efforts pastoring a dying church) a diocesan staff member, and a curious neighbor, took part in the deconsecration ceremony, after the church had been sold to a condo developer. The other church recently closed in my deanery, St. Luke’s and St. Margaret’s, Allston, held both public and private closure services. The building has not been deconsecrated as the diocese is contemplating reusing the space or restarting a congregation there. Please know that I mean no disrespect here–I find it interesting that so many comments are about what sort of service or liturgy was performed/used or if the church was deconsecrated when it closed its doors as opposed to the tragedy of another Episcopal Church closing. This reminds me of a conversation I took part in a few months ago about the acceptable wording of what to call what used to be known as Sunday School. I find it frustrating that we try so hard to get the “right” language or the “correct” procedure, that we have missed the bigger issue of bringing people in, sharing the Gospel, being the church Jesus envisioned. Has the language and the liturgy become a roadblock, or stumbling block? People are leaving the Episcopal Church and our parishes are shrinking. I’m not saying abandon the liturgy–but at what point do we lay the right language or the correct service/liturgy aside and be the church that Christ intended us to be? Leadership and mission are what move organizaitons to be relevant and sustainable. When an organizaiton is no longer relevant, it ceases to exist. It is great to be an Episcopalian. Even better to be one who is relevant to one’s community, in whatever form that takes. Our challenge is not to close more churches properly, but to put our talents to His use in whatever way serves Him best. Ann, I think language DOES matter. After all it’s how we express what we believe. People can throw the minutia of language at the wrong things, no doubt. If you’re spending more time discussing what to CALL Sunday School rather than how to offering a compelling program, that’s a problem. I think people come to the Episcopal church precisely because of the liturgical language — but they leave if the language starts to feel like lip service. PS. Sorry for the caps — no option for italics! I think the motive and reason for closing this parish was the need by the diocese for cash. The ever growing large salary of the diocesan offices, the ever growing non parish related costs to sustain a group of college kids who can’t find jobs, and the many trips aborad that the bishops go on all cost money. The sale of the property will go toward the coffers of the diocese not the devoted people who built and worked hard to keep Trinity chymouth.